The bi-annual General Contractors Association of Ontario (GCAO) Symposium has become a “must attend” event for our business — and especially this year. We are one of two designated media sponsors, and in about three weeks, will take on the other sponsor as a competitor for lucrative (and regional) Certificate of Substantial Performance (CSP) notice ads. My bad, in a previous version of this post, I mixed up the acronyms of the OGCA and the General Contractors Association of Ottawa (GCAO). Sorry. In exchange for contributions — in our case, in-kind promotion and advertising in our publications — exhibitors are given room for a simple table-top trade show set-up. We also of course can network and promote our products/services. The attendees, about 700 overall (including sponsors’ representatives) include plenty of owners/decision-makers as well as more junior staff from general contractors around the province. 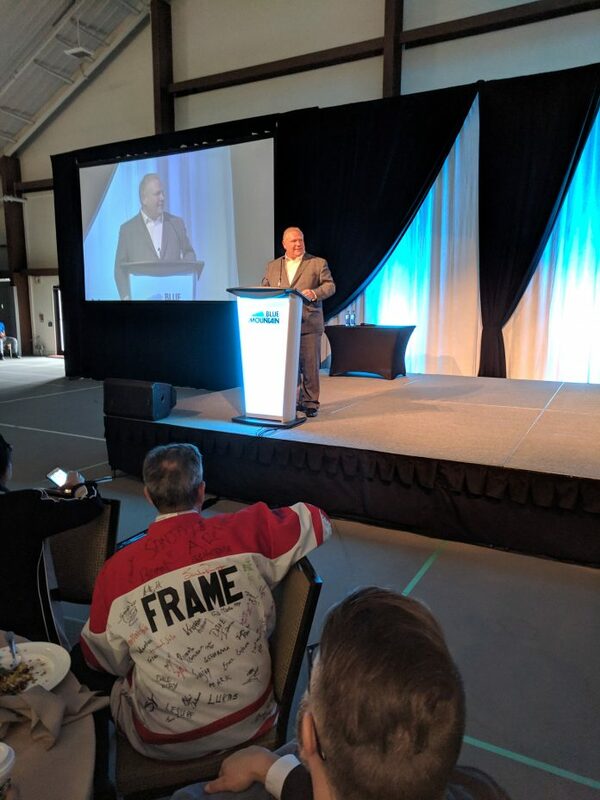 The guest speaker: The province’s premier Doug Ford, who stood around next to our booth for selfies and hand-shakes from symposium guests after his brief presentation. Shows, symposiums and events certainly can be costly from a marketing perspective; several sponsors (at the highest levels) committed thousands of dollars in fees, let alone the travel time and accommodation costs. Our business had a somewhat sweeter deal; event fees including meals were covered by our non-cash sponsorship contributions and by booking well in advance, the Blue Mountain Resort’s accommodations cost a bit more than $100 CDN per night. We more than covered the fees by direct advertising in our publications, though it will be a few weeks before I can get an idea of how well our message got through about the new certificates ads option in Ontario Construction News. While this blog posting has a decidedly regional focus, the concept here can work for you in virtually any industry/specialty and community. Look upstream at your market and determine which associations and groups serve your clients — and then assess whether it makes sense to contribute/support and participate in relevant associations. You might not have the internal marketing advantage of the publishing business, but I noticed how many OGCA Symposium sponsors have returned for many successive events. I expect they come back for more because they have achieved the results they are seeking.